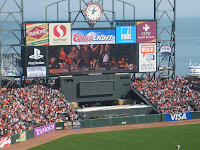 growing up 5 minutes away from candlestick park naturally lends itself to being a sf giants and sf niners fan. growing up in the 80's, i remember the championship years of the 49ers w/ joe montana, steve young, jerry rice, john taylor, ronnie lot, brent jones...i can just go on and on. w/ the giants, it was roger craig w/ will clark, matt williams, robby thompson, kevim mitchell and rod beck. as a child, i collected baseball cards. i actually remember mailing a fan letter to will clark w/ his baseball card hoping he would autograph it and send it back to me. how naive huh? i remember watching the world series against the a's in my living room and then experiencing the earthquake. i remember the disappointing 2002 season...where we completely fell apart and lost the world series. 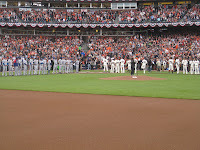 i actually was lucky enough to attend the NLCS series where we hosted the cardinals. that was my 1st experience in attending a postseason game and it was just sooo amazing how different the atmosphere was versus a nomal regular season game. one of my goals is to attend spring training. i'm very determined to do this...maybe when aj is bit older and can appreciate baseball, we can travel to arizona and hang out for spring training!! as the giants season started this year, very few expected much from the team, i honestly didn't pay too much attention either. 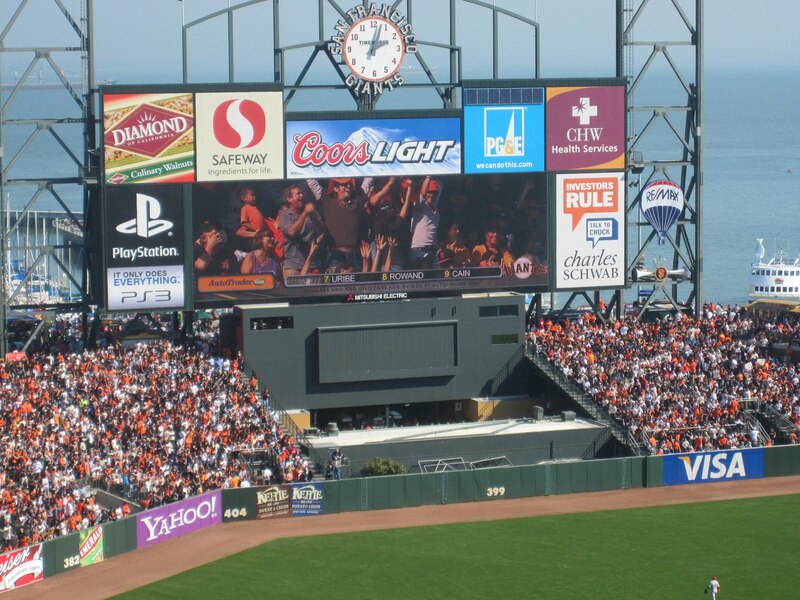 it wasn't until i'd say mid august that i started to pay more attention; as the giants started their hot streak and the padres started collapsing, i REALLY got focused. needless, to say, we all know how the season ends! we were very very fortunate and blessed to have gone to a game in each of the post season series. s got 6 tickets to game 2 of the nlds. unfortunately, that night was also his brother's rehearsal dinner so he was unable to attend. i went to the game w/ my brother, his girlfriend, my sister and brother in law and my dear friend, j. unfortunately, this was the game we lost in the series. though cain pitched a great game, the bullpen had a off night and we lost in extra innings. j lending me her panda hat! 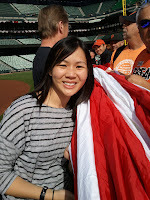 what an awesome series...s was lucky enough to get tickets to the 1st home game which was game 3. it turned out to be a day game which was a bit inconvenient but obviously, not a deal breaker. 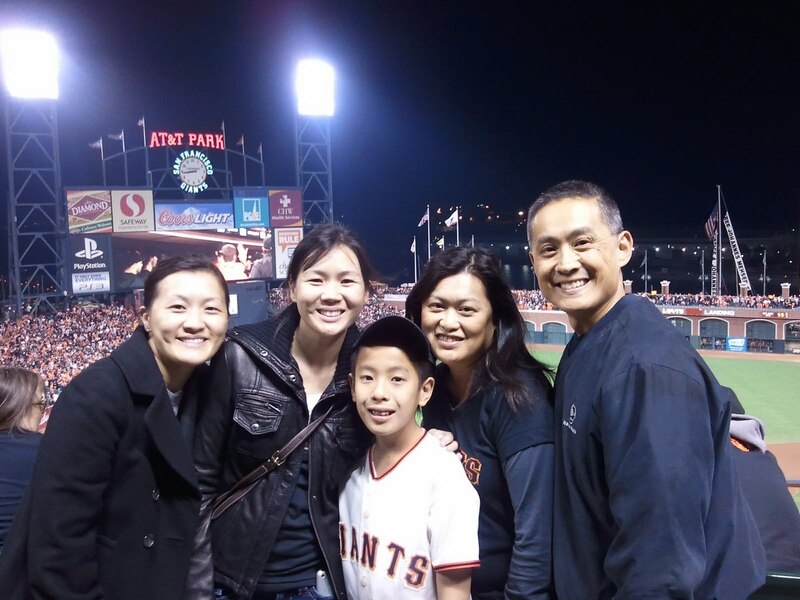 we went w/ my cousin and his son since they are always so generous in inviting us to 49ers / warriors / giants games. 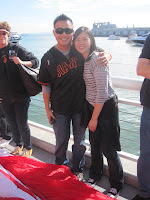 cain pitched an AMAZING game and we left as winners! probably not very noticable but my cousin and his son are on the jumbotron! they are the bright orange blob on the left side of the screen. hahaa. i don't even know where to start w/ this series. again, s worked his magic and got 4 seats to game 1 of the WORLD SERIES! s and i each got to pick one person to go w/ us (to be fair). 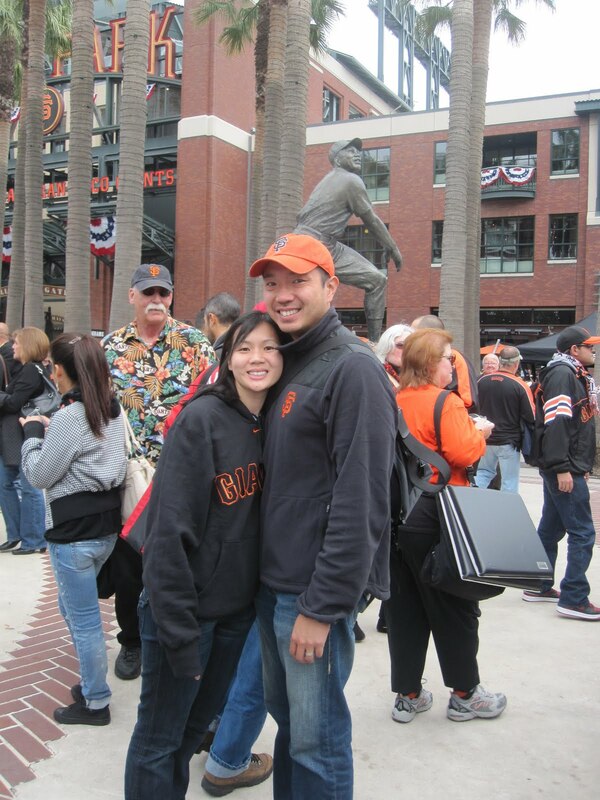 so s invited our friend that actually during the 2002 NLCS, gave us 4 tickets! i told my sister, brother and brother in law that they had to duke it out for the one available ticket. long story but the lucky winner was my brother in law. but it gets even better! my cousin's company has season suite tickets and select season ticket holders were offered a "once in a lifetime opportunity" to participate in the pre game ceremonies. she was great enough to sign us up! we had to basically take a day off to get to the park early to practice. volunteers had the chance to hold the american flag during the national anthem or shoot the streamer cannons off the warning track. s, r and i chose the flag and j picked the cannons. 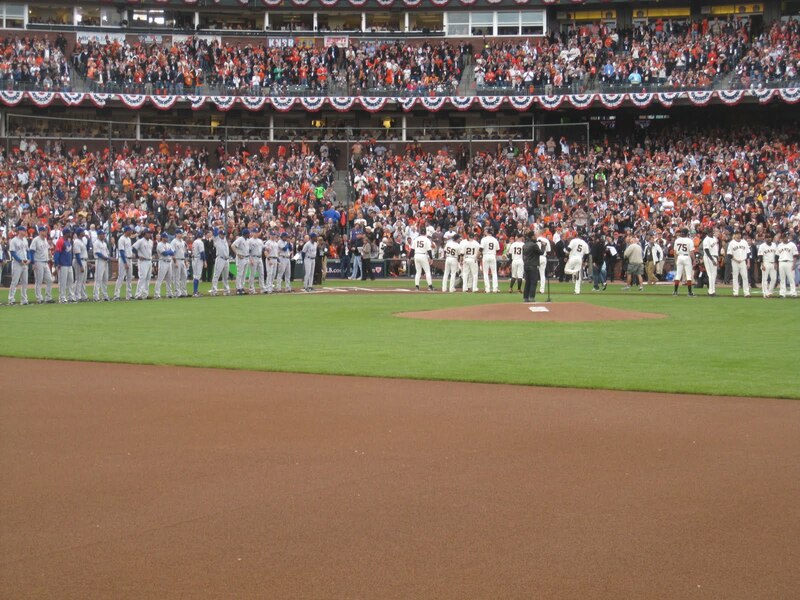 it was just unbelievable to be on the same field as the 2 teams playing in the world series. it was just such an unbelievable experience - definitely one of the highlights in my life. we won this 1st game - lincecum wasn't his normal stellar self but the offense was HOT and we just killed it!